The fallout from Operation Fast and Furious has demonstrated the desperation of the U.S. government to deal with the flows of drugs and drug violence from Mexico. At the heart of Operation Fast and Furious are guns: AK-47s, AR-15s, FN Five-sevens, and AK variants that the Bureau of Alcohol, Tobacco, Firearms, and Explosives (ATF) permitted to pass into the hands of gun smugglers so the arms could be traced to the upper echelons of Mexican drug cartels. These traceable firearms have been used in an estimated 150 murders of Mexicans as well as the shooting death of a U.S. border patrol agent. That murder triggered an investigation of the controversial operation now ensnares the Federal Bureau of Investigation (FBI), the Drug Enforcement Administration (DEA), and the Justice Department in hearings. Undergraduates constantly inform me that we study history to learn from our mistakes. As a professional historian, I know that is far from the truth. The decades-long war on drugs has ensured that guns and drug tropes continue to exist in hearings, popular culture, and news reporting. The US-Mexico border has been a space where drugs flowed north and guns flowed south. In 1977, the concern about U.S. guns fueling drug violence south of the Río Grande became a theme in the U.S. Senate hearing Illicit Traffic in Weapons and Drugs Across the United States-Mexican Border. The hearing, chaired by Georgia Senator Sam Nunn, (1972-97), sought information regarding the weapons flows to various criminal organizations in Mexico. With the present focus on U.S. gun flows to Mexico, the senate hearing in 1977 offers a glimpse into the perfect partnerships between gunrunners, disreputable gun dealers, and drug traffickers. The hearing took place more than thirty years ago, but a close reading yields various echoes into the present. Senator Nunn opened the hearing arguing that the U.S. should be gravely concerned about gun running. He mentioned journalist Hal Moore’s article “Drug Smugglers Trading Dope for Weapons” published in the Washington Star on January 8, 1977. For his case study, Moore focused on the drug culture of Culiacan, Sinaloa. He asserted that 20,000 of the 300,000 people of the city were involved in drug trafficking, and many received their guns from the U.S. and Asia. He discovered that an AK 47 sold for $2,000 in 1977 in Mexico, and it had the value of a ton of marijuana in Mexico. One AK-47 for a ton of marijuana was a highly profitable exchange for a U.S. based gun smuggler. Currently, an AK-47 costs approximately $450.00 in Mexico similar in price to that sold in the U.S. The arrest of Alberto Sicilia Falcón, one of the 1970s most successful marijuana and cocaine traffickers, triggered the investigation. A Cuban national, Sicilia Falcón built a highly sophisticated organization that moved in elite circles on both sides of the border. For example, Sicilia Falcón dated Irma Serrano, the ex-lover of a Mexican president (seen in the picture). At the time of the hearing, Sicilia Falcón was in prison in Mexico, and many of his U.S. associates had also been arrested. Peter Bensinger, a DEA agent who testified at the hearing, argued that fifteen percent of the known arms smugglers were also drug smugglers. Sicilia Falcón was no exception except he had gone a step further. With his associate Gastón Santos, they had negotiated with a U.S. firm for manufacturing rights to an automatic assault weapon in clear defiance of Mexican gun laws. Representatives of this U.S. company had met with the two drug traffickers and showed them two films that demonstrated what weapons could be manufactured: automatic pistols, fully-automatic pistols, assault rifles, and fully automatic assault rifles with rocket launchers (Senate 1977, 43). When asked if Sicilia Falcón could afford to manufacture such weapons, Bensinger’s response was a definitive yes. Later in the hearing, Rex Davis then director of the Bureau of ATF testified that legal gun dealers may have also contributed to gun smuggling. From a six month study of 36 gun dealers in New Mexico and Texas, Davis stated that of the 9.1 million rounds of 22 caliber and handgun ammunition sold over 8.1 million rounds were sold to people with addresses in Mexico(Senate 1977, 65). Davis acknowledged that a survey of licensed dealers led to investigation of only a few gun dealers who sold the largest amounts of ammunition to Mexican nationals. One in Brownsville, Texas sold 12 million rounds in one year. The investigators found that the gun shop owner falsified his records, and he had sold the majority of rounds to nine residents of Mexico. In the other investigations, a few gun dealers were responsible for the majority of illegal sales, and all had falsified their records. Like with drug traffickers, gun runners too reconfigured their cars and trucks to smuggle weapons and ammunition from the U.S. into Mexico. A truck seized by ATF agents from a group of California-based gun smugglers yielded 66 M1 carbines, 240 M1 carbine magazines, and 8,425 rounds of 30 caliber ammunition. The Mexican mark up on arms was not as significant as that compared to cocaine or heroin, but it still yielded large profits. In 1977, Davis argued that sporting rifles sold for 35 percent above US retail price while ammunition sold 50 percent above retail (Senate 1977, 67-72). Because of the profits to be made, by 1977 the ATF had indentified 710 people, organizations, and businesses allegedly involved in gun smuggling to Mexico. The question remained: were some of the 710 smugglers actually swapping arms and ammunition for drugs for resale in the U.S.? Of the 710, Davis claimed that 108 were involved in both gun and drug smuggling with 24 classified by the DEA as class 1 drug violators and 14 as class 2 drug violators. 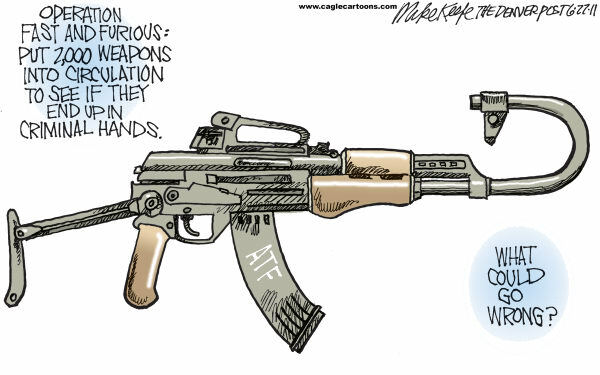 The perfect partnership was further substantiated and criticized by Senator Lloyd Bentsen of Texas who stated: ‘When I see the evidence of smugglers flying monthly into the United States with planeloads of heroin and returning with planeloads of M-16 automatic rifles, Mr. Chairman, I am convinced that our faulty weapons security policy is not only a threat to our security, it is—indirectly—a threat to our moral fiber as well”(Senate 1977, 106). With Operation Fast and Furious, it appears that Senator Bentsen’s warning has come true. Our faulty weapons security policy led the very agencies that have long battled gun flows to resort to questionable practices that have had devastating consequences on both sides of the border. U.S. Congress. Senate. Committee on Government Operations. Illicit Traffic in Weapons and Drugs Across the United States Mexican Border. 95th Cong., 1st session, January 12, 1977 (Washington, DC: GPO, 1977).